A sanctuary for cosmic seekers long before “Eat, Pray, Love” catapulted it higher in destination rankings, Ubud is the cultural and artistic heart of Bali where religion plays a central role in the locals’ daily lives. It is the spirit of the place – daily food and floral offerings in front of houses and businesses, sacred fire dances at the local temples at night, an unhurried way of life in close contact with the divine and nature – that attracts a new breed of “spiritual tourists” in search of auspicious beginnings or a peaceful way out of a mid-life crisis. Perhaps appropriately, Ubud’s name is derived from “ubad” or medicine. The consequent flow of tourists who want to recreate the transformative journey of the protagonist of the film resulted to a slew of exclusive resorts in Ubud. If budget allows, start your journey to healing in Ubud Village Resort and Spa where you can take stock of your life amidst visually soothing verdant rice terraces. Then take a dip in a bubbling hot spring in northeast Ubud in the courtyard of 10th century Tirta Empul, one of Bali’s holiest temples. Within a cycling distance is tourist-heavy Tegallalang but otherwise a picture-worthy village of gently rolling rice paddies which Ubud is widely known for. Wake up to a more dramatic landscape of limestone gorges viewed from one of the luxury villas of Ubud Hanging Gardens Hotel. West of it is the 9th century Goa Gajah or Elephant Cave Temple which welcomes visitors through its ornately carved demon’s mouth. The best hotels in Ubud are nearby and tend to cluster in strategic locations that provide magnificent views of valleys carved by Ayung and Wos Rivers. If you’d rather want to be in the thick of action and still within five kilometers of the town’s highlights, there are plenty of cheap hotels in Ubud along JL (short for Jalan or road) Hanoman, one of the town’s three main roads. The other is JL Monkey Forest where you can find a concentration of accommodation in Ubud which caters to a wide range of budgets and preferences. Further south is the sacred Monkey Forest whose resident monkeys are rather fearless and curious. 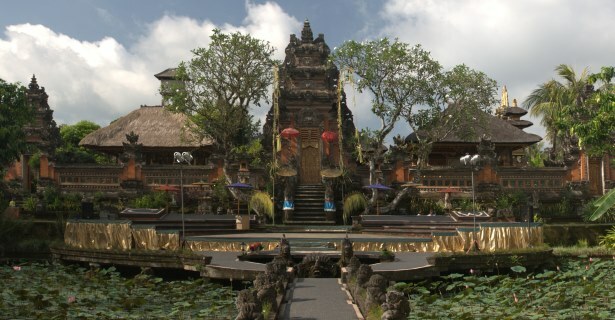 Book online to find where to stay in Ubud and find the best Ubud hotel deals. The native appeal of Ubud is not just confined to its rural green space. Ubud is home to most of Bali’s artists and artisans, and the town’s main streets are lined with their galleries and workshops. Rent a bicycle or scooter and browse the shops that line the main road between Sanur in the south and Ubud. These “craft villages” are filled with stone and wood carvers, silver jewelry craftsmen and painters. In the city centre, much of the shopping buzz takes place along Ubud’s main roads or at the local market at the corner of JL Raya Ubud and JL Monkey Forest. Determine the usual price for such items and learn to haggle before closing the deal; prices are not uncommonly ten times more than the baseline. As Bali’s haven for spiritual renewal, Ubud offers plenty of yoga classes and meditation studios on top of the usual assortment of indulgent spas. Resorts in Ubud, and many enterprising residents and expatriates, have created wellness packages in the tradition of Bali’s Tri Hita Karana philosophy. Sign up for one, or find peace within yourself, with the divine, and with nature following your own rhythms.